As usual, there is plenty going on in Nashville’s pop-rock community. The gals, in particular, are rocking the joint. Veteran Jonell Mosser leads a grooving group that also includes Disc of the Day winner Erin McCarley and excellent newcomer Susan Hartman. The DisCovery Award, however, goes to the guys of Kindercastle. Both Kindercastle and Jonell are playing this evening, and it’s entirely possible for the energetic among you to catch them both. —The opening track and title tune to Jonell’s new CD finds this supremely soulful vocalist grooving in a track full of buzzing, stinging guitars and heartbeat bass. To many, including me, this is Nashville’s finest “unknown” singer. In addition to this Dylan gem, the album includes offerings from Michael McDonald and Harlan Howard, plus four she co-wrote. The cast includes the stellar Jeff Coffin, David Hungate, Tom Britt, Jimmy Hall, John Cowan, Jerry Douglas, Craig Krampf, Stuart Duncan, Victor Wooten and soul sisters Bekka Bramlett, Sheila Lawrence, Etta Britt and Vickie Carrico. —Best known as Donna Summer’s husband and songwriting collaborator, Nashville’s Sudano has his own history as a member of Alive and Kicking (remember “Tighter, Tighter?”) and Brooklyn Dreams (”Heaven Knows”). He sounds surprisingly youthful on his new solo CD Life and the Romantic. This sweet, touching nuptial ballad from it has become a surprise A/C hit. So good for him. —This young Music City lass has become one of our major pop/rock players. The bopping title tune to her album was featured in the movie He’s Just Not That Into You. The downbeat lyric contrasts with a furious rhythm track, sighing strings and plinkety piano. Like the rest of the CD’s tracks, this is something you’ll want to hear over and over. Worth every dime. —SelecTone is Steve Wariner’s label. This synth-based outfit features his son Ross and cohort Cody Uhler, who have been musical collaborators since they were 14 years old. The wafting tones and falsetto vocal soarings here are quite winning. 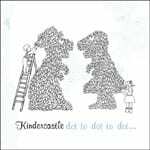 The track appears on Kindercastle’s new EP Dot to Dot to Dot. It follows the group’s 2008 debut album, In a Tizzy, which is also recommended listening. By the way, Steve’s other son Ryan has been out on the road playing lead guitar for Jewel and is now touring with LeAnn Rimes. —By day she’s a licensing manager at ASCAP. Hartman’s secret life is as a pop rocker. Her scintillating EP kicks off with this groove-soaked track with none other than Steve Cropper providing lead guitar. Her sunny, saucy vocal is as cool as the R&B flavored instrumental work. I’m in.